The whitewater on this run varies significantly with water level. Because the run channelizes significantly, it can be run at very low water levels (500 and below) and still be an enjoyable class III romp. At lower levels, neophyte boaters should keep a watchful eye out for the Sunshine hole. Although the move is fairly straightforward, this hole gets sticky at low water levels, and I can attest from personal experience that it's sticky enough to recirc a swimmer. The rest of the run at low flow is straightforward, but be aware of the dangerous pocket in the wall at Wallslammer. Expect a long paddle out through the class II. Due to the relatively warm weather, its placement lower in the Arkansas drainage, and the ability to run it at low flows, this can often be run as early as Febuary and late into the fall. At high flows, this run graduates into class IV to IV+ territory and is almost guaranteed to freeze a grin on your face. Our group caught it at 4200 cfs once, and it was a huge wavetrain ride the entire way down with only a couple sticky holes to watch out for (most noteably "Boateater", which lives up to its name). We had a mix of ability levels, and even timid class IV boaters with a bombproof roll made it down fine (but don't minimize the danger of swimming at high flows). A flow note: The alternative gauge at Wellsville is useful in the offseaon when the Parkdale gauge is not operational. 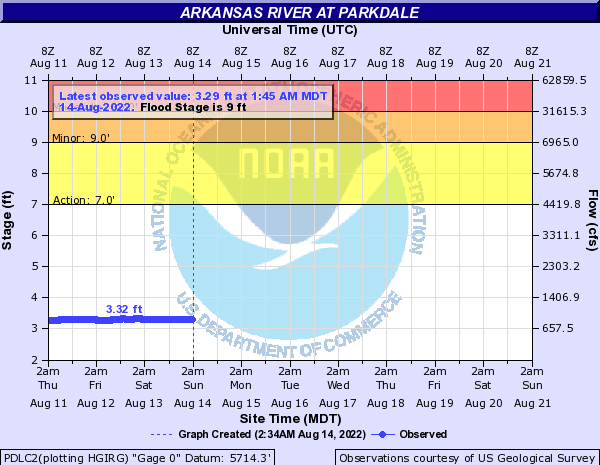 Primary Gauge ARKANSAS RIVER AT PARKDALE, CO. This is the put-in for the Gorge 1/2 day. It's about 1 mile from the entrance to the Gorge just off Hwy 50. Great ramp and parking, but it is a fee site - $7.00 per vehicle. Used heavily by commercials on weekends. The rapid starts after a concrete wall on the river left. Eddys up top to scout on river right. There is a path on top of an old pipe. Or read and run but punch through/avoid the big hole pictured here. Read and Run. Avoid the pour overs. Wall slammer is not an incredibly hard rapid located directly under the Royal Gorge bridge but there are some things to consider. The two main features are a river right hole and a river right undercut cliff wall. The hole is easily avoidable and fairly easy to get out of but it is a bit sticky. About two thirds of the way down the undercut cliff wall is a cave like crack in the rock and multiple pins have been reported here. Swims are not fun due to an assortment of man made debris on the river edge that can tear you up and snag. The rapid is easy if the wall slam is avoided. There are plenty of other rapids on this run to get some glory! It would be a difficult scout. Steep canyon wall on one side and train tracks on the other.